City Growth Partners founder Moddie Turay (left) and principal partner David Howell (right) standing in front of renderings of Brush House and Brush 8. The city of Detroit has two problems when it comes to the multimillion-dollar residential projects popping up all around the city: inclusiveness to African-Americans living in them and African-Americans developing them. At least one of those issues were addressed for the three new residential projects being developed in the city’s historic Brush Park neighborhood on the outskirts of downtown. 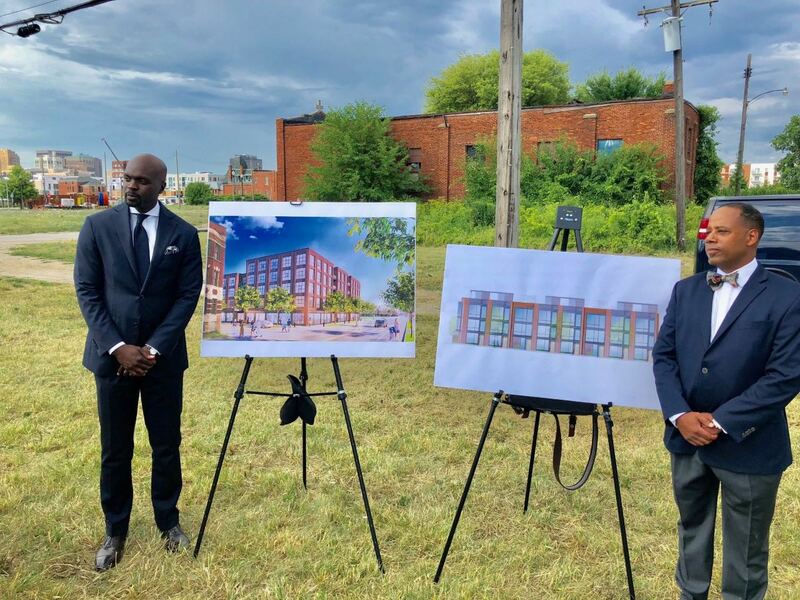 Mayor Mike Duggan, Detroit’s Chief of Services and Infrastructure Arthur Jemison, and developers gathered on the corner of Erskine and Beaubien to unveil the three new projects, which total $102 million. The two projects being developed by African-American development company, City Growth Partners, will total $57 million and is led by the founder of City Growth Partners and former executive vice president of real estate and financial services for the Detroit Economic Growth Corp., Moddie Turay and principal partner David Howell, who is a former DEGC executive as well. The two projects being developed by Turay and Howell are called Brush House and Brush 8: Brush House will feature 37 affordable units, 20 percent of the total units, at 80 percent of the area median income. These units will run about $900 a month for a one-bedroom and be available for residents making $39,000 a year or less. The development will also include 15,660 square feet of ground floor retail and 127 underground parking spaces. City Growth Partners expects to break ground on Brush House in fall 2019 and work is expected to be complete by 2021. Brush House will sit on 0.92 acres of land, which CGP bought for $1.2 million. Brush 8, a luxury townhome development, will bring eight for-sale units to Brush Park. The $5 million, three-story development is also projected to break ground in fall 2019. It will sit on 0.32 acres, bought for $307,000 by CGP. Construction will begin in 2019 and should be completed by the end of 2021. After Turay left the DEGC in 2017, he said he went to a coffee shop in West Village Detroit and called Howell to be his new business partner. The following week, they begin putting together a business plan for the Brush Park development. Continuing to dispel the notion that there are not “two Detroits”, Duggan reminisced on the time he was the chairman of the Detroit-Wayne County Stadium Authority 20 years ago, building Comerica Park and Ford Field, and thought one day, Brush Park would be the most sought-after housing area in the city. He praised the city’s effort on building mixed-income and affordable housing for Detroiters, with Brush House and Brush 8 being the latest projects. The third project is, Brush + Watson, which plans to add 180 new residential units to the neighborhood in a $45 million development. American Community Developers, Inc., will set aside 90 units, or 50 percent, as affordable units. Of those units, approximately 45 will be available for starting around $1,000 a month to residents making 80 percent of the Area Median Income, or about $42,000 a year. An additional 45 units will be available to residents making 30-60 percent of the Area Median Income or about $16-28,000 a year with rent starting around $400-700 a month. The Area Median Income is set annually by federal housing rules. The project will also add 8,500 square feet of new street-level retail and 170 underground parking spaces for residents. The Brush + Watson project is expected to break ground in late 2019 and is expected to be completed by 2021. Dr. Irvin Reid, who was the first black president of Wayne State University, is a development partner for the Brush + Watson project.